Catalan President Carles Puigdemont decided Tuesday, Oct. 10, like Iraq’s Kurdistan leader Masoud Barzani before him, to put his people’s independence vote on hold for negotiations. This shifted the weight of international pressure from the Catalan separatists to the Spanish government to accept reasonable terms. The European Union and its members leaned hard on Puigdemont to hold back from separation, warning that Catalonia would be expelled from the bloc and its shared currency, the euro, if it declared independence. To get back in, it would have to re-apply — a lengthy and uncertain process. Moreover, he could not ignore the hundreds of thousands of people who demonstrated in Barcelona over the weekend against independence, waving red-yellow Spanish flags through the city center. Spanish Prime Minister Mariano Rajoy had vowed that Spain will not be divided and promised to use any lawful measure to stop Catalonia’s secession. Losing Catalonia, which has its own language and culture, would deprive Spain of a fifth of its economic output and more than a quarter of exports. Catalonia’s situation is analogous to the Kurds in the sense that both hold economic clout. Losing Catalonia would deprive Spain of a fifth of its economic output and more than a quarter of exports. The KRG already controls the oil fields of northern Iraq, and Kirkuk their center, joined the Kurdish independence referendum. The Kurdish dialogue with the Iraqi federal government is due to begin in Baghdad within a few days. The two separatist leaders in Barcelona and Irbil reached the same conclusion: Whatever the justice of their case, it is almost impossible in the year 2017 to achieve independence and change national borders without the backing of a broad international consensus. 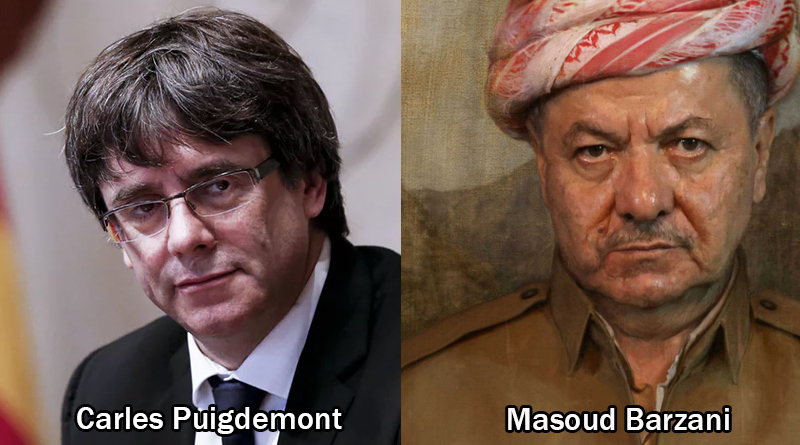 Catalonia is like a second or third wife in an Islamic marriage, being threatened to be thrown out on to the streets if she dares file for divorce or file for custodianship of her children in a court of law. How fortunate for Madrid and Baghdad that the seceding territories don’t have effective leadership willing to take the battle all the way to court. If Spanish or EU authorities (who will never be subject to Catalan law) decide to neglect anything and everything healthy or organic within Catalan society, who’s going to intervene on Catalonia behalf? The Spanish are well-known for their historical atrocities brutally committed against innocent Native American populations. What makes the Catalans think that they are immune to the same negative treatment even if they decide to stay in a union with Spain? It’s not a good marriage, and divorce seems appropriate to everybody but the insurance and banking sectors. At the end of the day, is raising another generation of slaves to Madrid and Brussels really what Catalan-speaking mothers want for their children? If so, keep that same “President” and watch him sell out to the highest stakeholder. My solution is simple. Catalonia should declare independence, and Spain should agree. Together, both Catalonia and Spain can appeal to the Vatican and the broader Christian world for financial assistance!!! It is VERY EXPENSIVE to determine whether the Catholic Church could and would consider granting PERMISSION for divorce, (and while that takes years to figure out, both sides would be eligible for religious charity). With good counsel, Spain might wish for a divorce, and just not know it because of ingrained Catholic pressure. If the Pope would grant permission, Spain would then preserve it’s Christian Heritage and even be a trendsetter for family values in the Christian world. Remember, Catholicism is much stricter then rabbinical or secular law in regards to marriage law. Catholics are historically stricter about marriage and divorce, while both rabbinical and secular courts routinely grant divorces and remarriages. My way, everything could be co-funded by religious organizations, who will anyways want to ensure that such important issues are handled with respect to their own religious causes and beliefs. AND, it would be a very powerful good deed for Christians of all ages and backgrounds to chip in and help with the costs. Zibnew Brezinski was a supporter of Pol Pot, the United States supports murderers and dictators all the time. John McStain supports Isis, they must have really done a number on his mind in the hanoi hilton. CIA needs to be cleaned out and re organized. The King of Spain should allow for a separation of the two governments under his one crown. The countries must remain “brothers” as countries do in the commonwealth. They both look like they have had the good life..and do not wish to have a mar tyrs anytime soon with the goats tied around it at the plaza of mercados. I have seen these kind of men before, and I think so has everyone else. Correction..martyrs statue. my cat hit the delete key. My apologies to the international community.